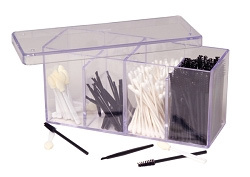 Multi-purpose unit designed to hold/organize amenities such as disposables, implements, brushes, files, etc. It has 4 partitioned sections. Clear, see-through design makes for convenience. Size: 8" W x 3.5" D x 4" H. Contents not included.